This book is good in all aspects except it falls short on the part people specifically want to learn, the technical part, the part on how to write. The book starts of promisingly with the introduction to the materials, the correct posture and mentality you should adopt. The information is useful and insightful. It assumes no prior knowledge on the reader's part. Then comes the part on techniques where you're shown pages of alphabets that you're supposed to copy. That's pretty much all about the techniques. Modern calligraphy from what I've learned and surmised from the book is a free and easy form. There's no specific style. You create your style. There's no style guide or that sort of thing in the book. The pages for alphabets are just for you to loosen up, to let you know when to apply pressure to the strokes (in the middle, and when the nib is going down) and where not to (at the start and end of the strokes). Next, the book goes on to intermediate techniques and tools, such as working with different materials, watercolour, gouache, different types of ink, paper, etc. The techniques are of writing your letters into a circle or writing on dark paper. Highlight of the book are the DIY projects included. There are lots of ideas on how you can use calligraphy for decorations and different purposes, such as for on different types of cards, letters, etc. The projects are fun and easy to create on your own. Most importantly, the results are wonderful and it really brings out how calligraphy can make things more beautiful. The author has said on many occasion that calligraphy is not like handwriting and it's more like an art form. After looking at the beautiful pictures, it's easy to see why. 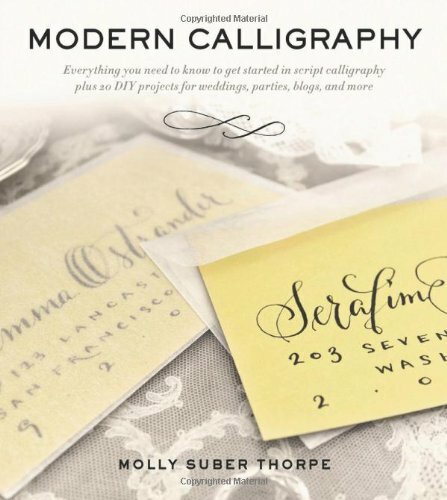 This is a good book to get if you want ideas and projects on how you can apply the calligraphy that you have learned. But it's a book that falls short of teaching those techniques. To learn calligraphy techniques, I would recommend you get Calligraphy Bible instead. Another interesting book on calligraphy to check out is Calligraphy: A Book of Contemporary Inspiration.